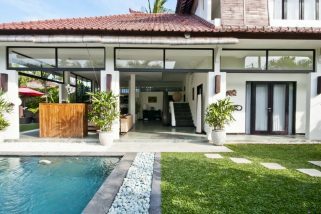 Villa 8 Super Deluxe is a gorgeous two-bedroom Seminyak holiday villa to rent enveloped in tropical foliage and nestled in the heart of trendy Seminyak. Here you’ll find the perfect site for a relaxing but thrilling getaway in one of South East Asia’s most beloved destinations. 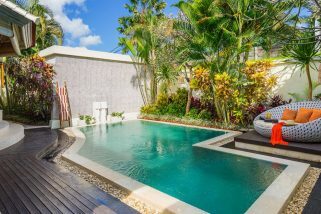 The property is suited to small families or groups of friends looking for a villa that’s lush and private but provides easy access to Bali’s best boutiques and its buzzing nightlife. The two bedrooms at Villa 8 Super Deluxe are spacious and elegant. 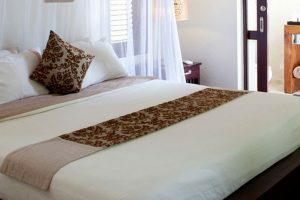 They are fully air-conditioned and furnished beautifully with sumptuous, king-sized mattresses and soft, fresh white linens. Both of the accompanying en-suites are newly built and include high-pressure, modern showers in stylish glass partitions. Both en-suites come with all of the amenities you’ll need for a comfortable, satisfied stay. 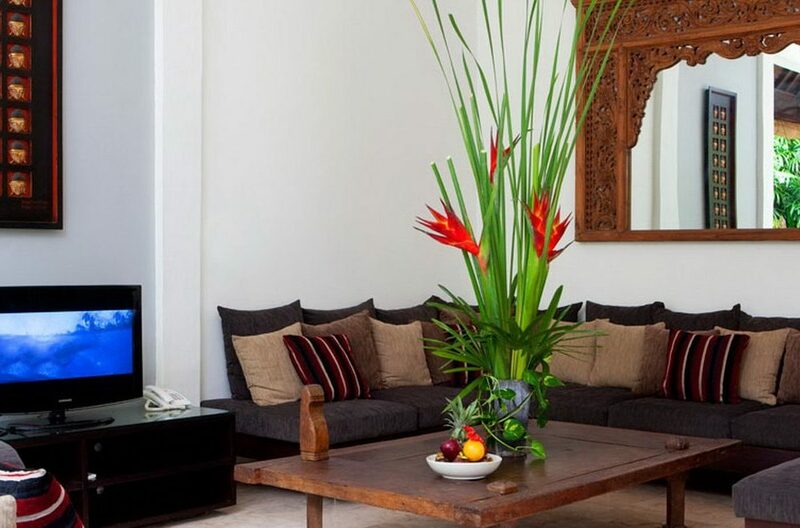 The living area was designed with a warm, earthy color scheme and includes traditional Balinese hand-carved décor. Inviting and comfortable, the living area’s open-plan layout blends beautifully with the natural tropical foliage outside to provide guests with a distinctly exotic holiday experience and a delightful tropical breeze. The long couch is arranged in an alcove around a large wooden coffee table, providing a cozy setting that was made for chilling. Directly facing the couch is another settee so there’s ample space for stretching out and lounging while watching a movie on the flat-screen TV or simply enjoying each other’s company. The villa comes with a fully equipped kitchen and a dining table that seats up to six comfortably. 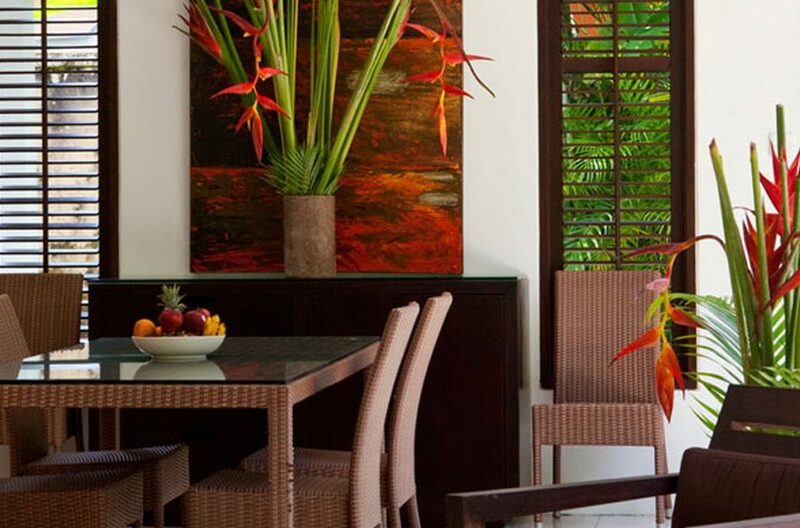 Here guests can share a meal while overlooking the perfectly manicured garden and twinkling leaf-shaped pool. You’ll find yourself well-looked after by the staff at Villa 8 Super Deluxe. Alongside with daily housekeeping, gardening, pool maintenance, you’ll appreciate the little luxuries like lovely fresh flowers, fresh linens and towels and a newspaper delivered daily. 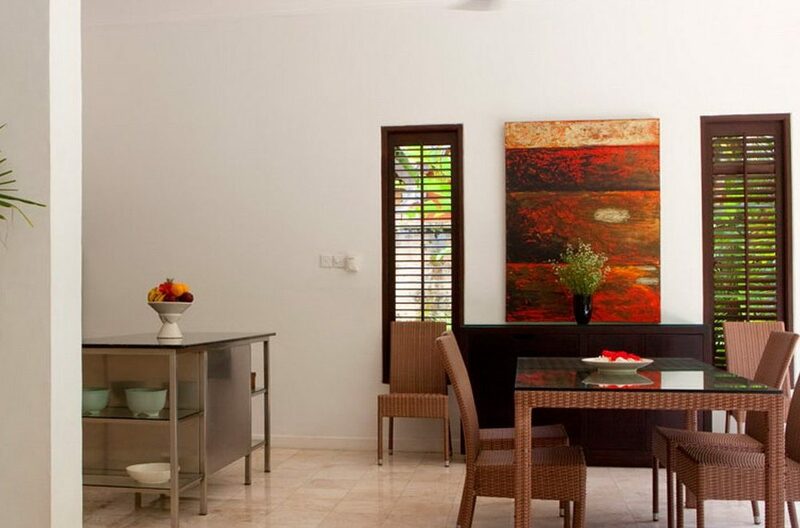 The staff at Villa 8 Deluxe are happy to help with any additional requests such as drivers, private chefs, masseuses, babysitters or assistance with booking tours and family outings. 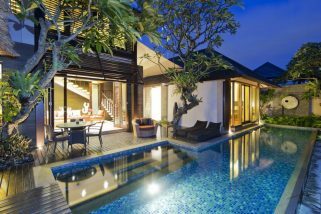 Villa 8 could not be in a better location as Seminyak is synonymous with luxury and trendiness. Spoil yourself rotten with the unique boutiques that offer gorgeous pieces of clothing at unbeatable prices. Or, if you’re after more of a gastronomic experience, you’ll go dizzy with the number of choices available. Many of Bali’s most famous beach bars serve up excellent food alongside some delectable cocktails. You’re only a 5-minute walk from Ku De Ta, Potato Head, La Plancha or several other family-friendly beach club venues. It’s time you enjoyed the spoils of Bali on a daybed by a pool with an awe-inspiring sunset for a backdrop. 1 time return airport transfer for minimum 5 nights booking. 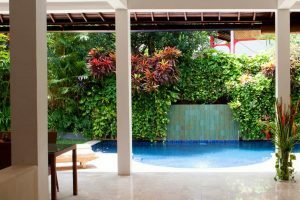 Charming Balinese simplicity, combined with the elements of refined modern luxury living, this is what to expect when you walk through the gates of your private holiday villa, amid holiday pleasures of Seminyak.